When 400,000 Allied soldiers are trapped on the beach of Dunkirk by the German army, civilian boats are commandeered to evacuate them. Dunkirk is an incredibly tense and stressful film. From the first gunshot, the film pulls you in and doesn’t let you go. The sounds are so loud it feels like you’re right there on the beach and the RAF and Luftwaffe planes really sound like they are flying over and around your head. Dunkirk is an incredibly loud film, and it can be disorientating but that helps put you in the shoes of the stranded soldiers. 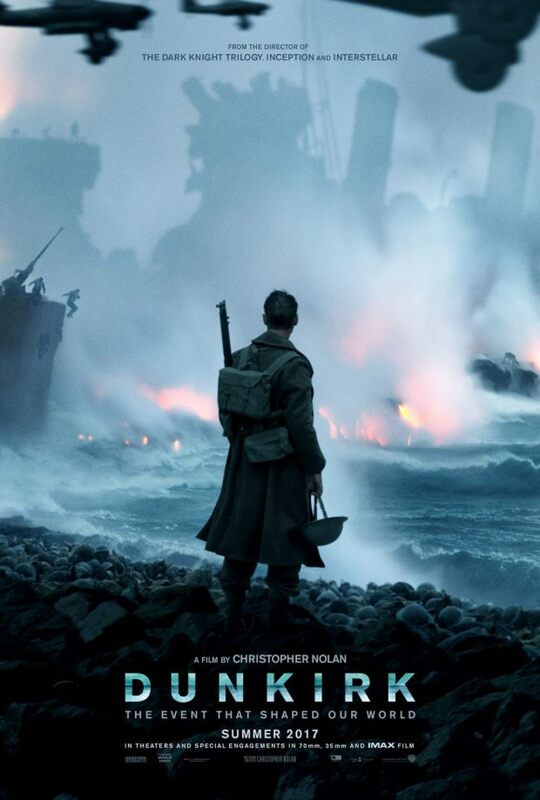 There’s three groups of characters you follow; RAF pilots Farrier (Tom Hardy) and Collins (Jack Lowden), civilian Mr Dawson (Mark Rylance), his son (Tom Glynn-Carney) and their friend George (Barry Keoghan) who are making their way to Dunkirk to help rescue the troops, and a trio of soldiers who are desperate to get off the beach. It’s a bit confusing at times as these events aren’t always running simultaneously but it’s not too hard to follow and each groups story is compelling. A lot of the characters aren’t named, or are maybe are called by their name just once so it’s easy to miss, so while they aren’t really fully-fleshed characters that didn’t really matter. The situation they’re in is so dire that you are willing and hoping they survive, and it doesn’t matter what or who they’re trying to get home to, they just need to be off that beach. This is especially true to the trio of soldiers played by Fionn Whitehead, Aneurin Barnard and Harry Styles. You know next to nothing about them but the actor’s performances of desperate and scared young men is all you need to root for them to survive. Another thing that’s quite interesting and clever is that you never see a German soldier. There’s the Luftwaffe that have dogfights with the RAF over the sea, and the Allied forces do get shot at but you never actually see a German solider. This helps to not vilify the Germans and also adds to the suspense as you are never sure where the enemy is hiding or how close they really are. The score by Hans Zimmer is definitely worth mentioning. I don’t always talk about the score or music in films in my reviews, often because I don’t really notice it, but in Dunkirk the score helps crank the tension up a notch. The ticking clock sounds reinforce the fact that time is running out for all these men and adds to the stress you feel. Dunkirk is a brilliant film. It’s well-shot, all the actors give great performances and it is an incredibly tense film about people desperate to survive. It is one of those films that’s worth seeing at the cinema, if not for the action (which is spectacular) but for the sound that immerses you into the film. 5/5. I love film scores, they’re the best thing to listen to while writing in my opinion. There’s so many brilliant composers out there but Hans Zimmer is my favourite. I saw him live a few years ago at Hammersmith in London and it was the best experience, and probably my favourite gig I’ve ever been to. I wrote (more like gushed) about his concert on my blog here. He’s composed so many iconic scores, from the superhero films like the Dark Knight Trilogy, Man of Steel, and The Amazing Spider-Man 2, to epic films like Inception, The Last Samurai and Gladiator. He spans all genres, has worked with so many great directors and still manages to bring something new and different to each of the films he works on. I find it hard to pick a favourite soundtrack of his. I think The Dark Knight was the first film score I bought so that has a special place in my heart, The Lion King gives me goose bumps and I adore both Sherlock Holmes and Inception. I love how kind of mainstream Hans Zimmer is becoming. He’s got a world tour this year and he performed at Coachella a few weeks ago – can you imagine a film composer performing his scores with a full orchestra at a music festival like Coachella a few years ago? It’s kind of mad but brilliant. It makes people listen to the scores, and seeing all those people on stage really shows how much time, effort and people power it takes to make a film score. Below is a compilation of some of Hans Zimmer’s best, or most famous, film scores – I’ve been listening to it as I write this post! 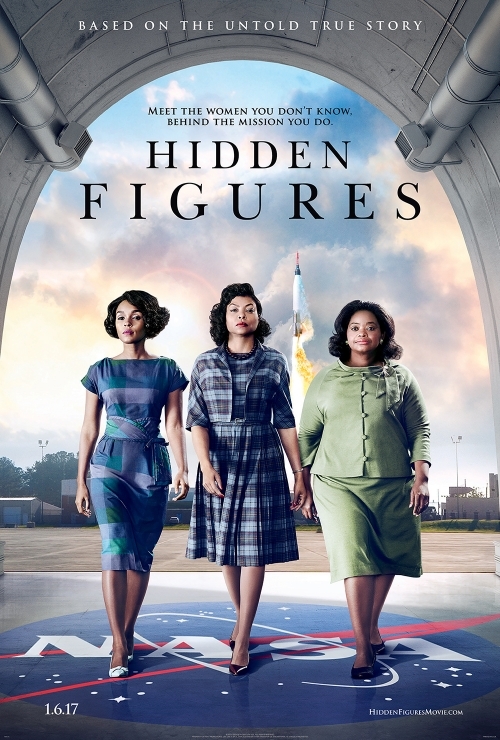 The true story of a team of African-American women mathematicians including Katherine Johnson (Taraji P. Henson), Dorothy Vaughan (Octavia Spencer) and Mary Jackson (Janelle Monáe) who played a vital part in NASA during the early years of the American space programme. Each of the three leads are brilliant in their roles. They feel like friends who laugh together and support each other but they are also so incredibly smart. Their chemistry is palpable. Katherine is a human computer and can figure out maths that hasn’t even been invented yet, Dorothy is wise enough to get ahead of the game, learn things like IBM computing and make her and her colleagues invaluable to NASA, and Mary wants to be an engineer and while her boss, a Polish Jew, can see her potential, she fights when every door seems to be shut in her face. The supporting cast is great too. Jim Parsons’ Paul Stafford is one of the mathematicians who doesn’t like Katherine is smarter than him and just about every other man in the room, Kirsten Dunst’s Vivian Mitchell is Dorothy’s boss and Kevin Costner’s Al Harrison is in charge of the division that works out how to put a man in space and bring him down again. Hidden Figures isn’t a particularly surprising film as it has the same standard formula just about any true story film has – but that doesn’t diminish how brilliant it is. Hidden Figures knows exactly what it is and it doesn’t need huge twists because the history and these women’s lives are interesting enough. On a purely aesthetic level Hidden Figures is a beautiful-looking movie. The costumes, hair and makeup are brilliant and the soundtrack is full of catchy songs from Pharrell Williams and Mary J. Blige. The score reunites Pharrell Williams and Hans Zimmer and they produce music that’s exciting and heartfelt and fits the time period and the film itself wonderfully. Hidden Figures celebrates those who history, and society, tends to overlook and shows the power of perseverance and friendship. It is amazing to see a film with three African-American leads who are masters in their field. It’s an inspiring yet also frustrating when you see what these women had to put up with, yet they still wanted to be a part of something amazing and contributed to NASA’s success. Hidden Figures will leave you with a huge smile on your face but along the way you may shed some tears, both happy and sad, and it’s really a great, crowd-pleasing movie. 5/5. Last night I went up to London to see Hans Zimmer live at the Eventim Apollo in Hammersmith and it was one of the best nights ever. I love film scores (they are the best thing to listen to when you’re writing a dissertation) and Hans Zimmer has scored some of my favourite films and a lot of his music has become easily recognisable and iconic. So, when I heard that Hans Zimmer was going to be performing his own music for just two nights I knew I had to be there. A manic scramble for tickets on the morning they went on sale led me to (amazingly) get front row seats – yes they were no doubt more expensive than seats further back or in the circle but I’m so glad I paid that money because the seats were incredible. The show kicked off with a medley of music from Driving Miss Daisy, Sherlock Holmes and Madagascar which were all a lot of fun. 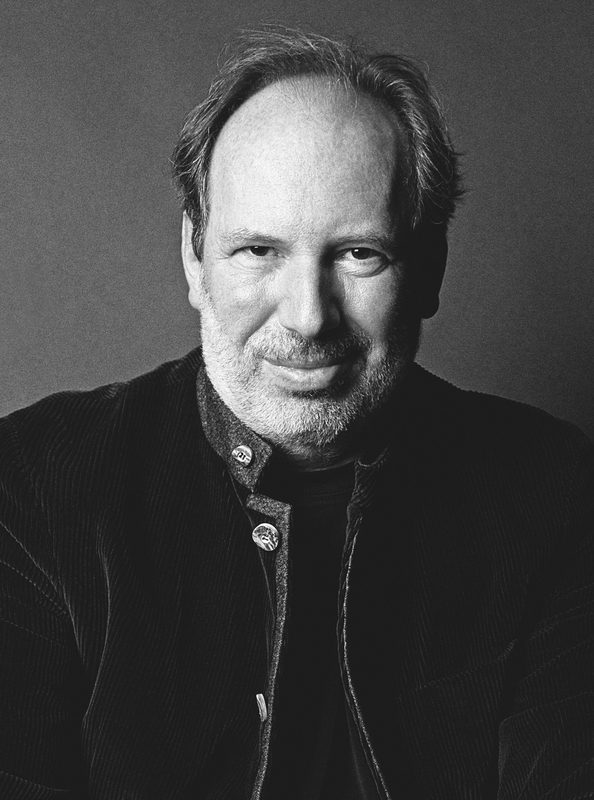 Hans Zimmer would talk in between each musical selection about how he got the job of working on the film the music was from or how he got the ideas for the arrangement. One thing that struck me was how charismatic Zimmer was. I know it’s presumptuous but for someone who isn’t necessarily front and centre when it comes to a film he was a great public speaker full or charisma and humour. I suppose while he may not be a lead actor he is the leader of an orchestra and a choir. When certain films scores were performed I got goose bumps and when The Lion King was performed I got tears in my eyes (it’s my favourite Disney film). The Lion King compilation was kicked off by Lebo M singing Circle of Life – I think that got one of the biggest reactions from the audience. Afterwards Hans Zimmer said that this was the second time (the first being the night before) that Lebo M had performed with him on The Lion King soundtrack since it was first recorded twenty years ago. That made the whole thing even better. The first half was incredible and finished off with a Pirates of the Caribbean medley which was a lot of fun. During the second half there was a surprise appearance from Pharrell Williams. I loved the set up for this. Hans Zimmer said that the string section would be playing something a little different, something classical, which they did for about thirty seconds before the music changed and Pharrell appeared on stage to sing Happy. Needless to say the audience went slightly mad and it was so much fun. 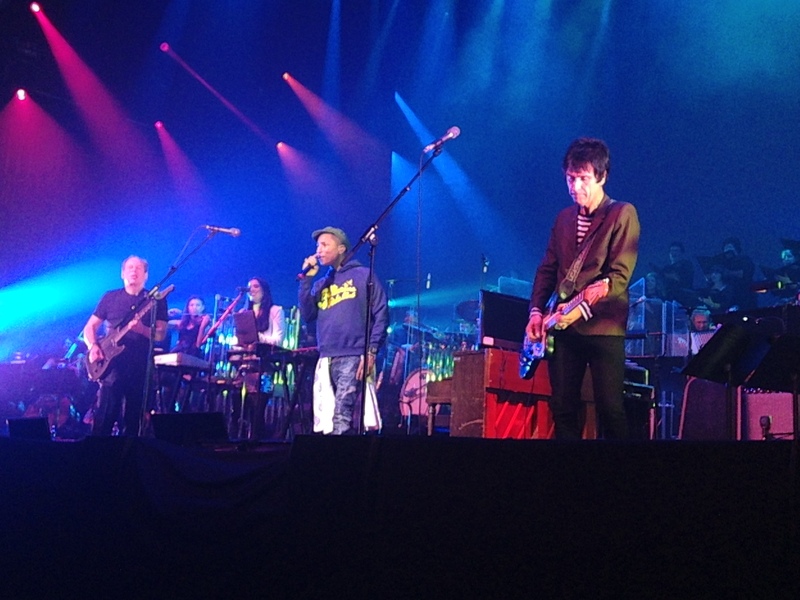 Then Pharrell joined Hans Zimmer to perform Electro from The Amazing Spider-Man 2 which was incredible. That music is eerie and manic when a part of the film but when it’s live it makes to ten times more frenzied and brilliant. 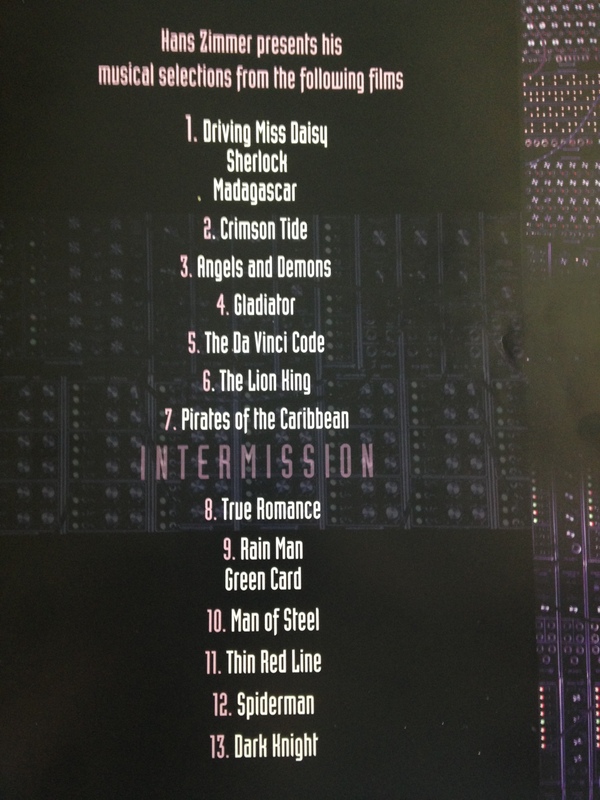 The show was finished with a medley of music from The Dark Knight trilogy which was fantastic. When the first notes were played (which sound kind of like bat wings to me) the crowd started to scream. Hans Zimmer got a standing ovation when it finished and no one sat down until the curtains opened once more – for an encore of music from Inception. That really was incredible and it made the hairs on the back of my neck stand up. Hans Zimmer is obviously an amazing composer and a talented man playing the guitar, the banjo, the piano, and the drums during the course of the show but his musicians, orchestra and choir can’t be left out. They were all incredible. Where I was sitting I was looking directly at Richard Harvey who plays any type of pipe and woodwind instrument you could think of as well as a keyboard and some sort of harp-thing. Seriously there were at least twelve different woodwind instruments surrounding him including the clarinet and panpipes or various sizes and there were so many instruments that I couldn’t name. The violinists Ann Maria Simpson and Aleksey Igudesman were fantastic with Igudesman putting on different hats to correspond with the film score they were playing – he wore a Roman solider helmet during Gladiator and a deerstalker during Sherlock Holmes. Czarina Russell was an amazing singer, joining Lebo M in The Lion King medley and taking the lead in other songs, she also played the drums and huge pipes that she hit with hammers. 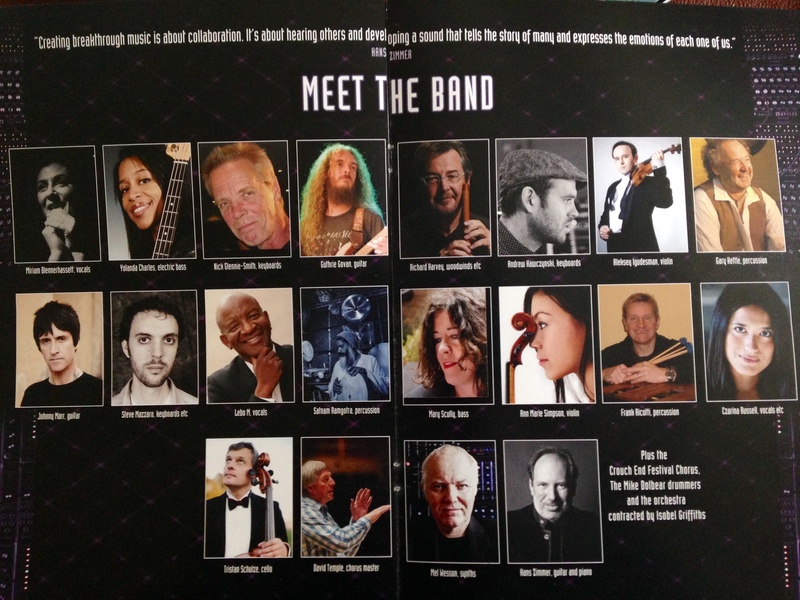 Really I could go one and mention every single person in Hans Zimmer’s band because they were all incredibly talented and they all looked like they were having so much fun. I think I’ve used a lot of superlatives during this post but they are all well deserved. It was honestly the best show I’ve ever been to. I’ve been to gigs and concerts and stage shows but nothing has made me feel as happy and overwhelmed as the concert last night. All the musicians were so talented and Hans Zimmer led them all beautifully. If I ever get the chance to see Hans Zimmer live again (or any film composer live) I am going to grab it with both hands. Thank you Hans Zimmer for making incredible music and making films sound so much bigger with it. Thank you for a wonderful concert and night I won’t be forgetting in a hurry.